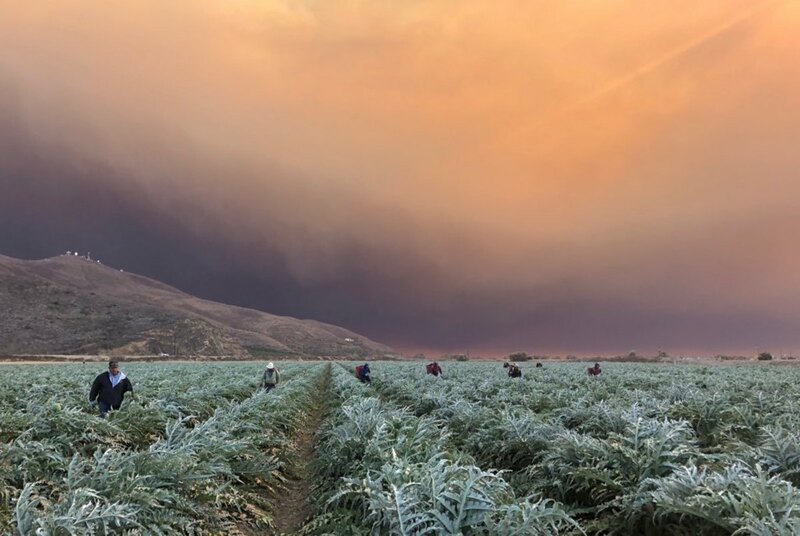 Farmworkers in Oxnard, California, continue to labor underneath dark smoke from the Hill and Woolsey fires burning to the south. As smoke from the Hill Fire and the massive Woolsey Fire began blanketing Oxnard, California, last Friday, a group of students from Oxnard Union High School gathered downtown to prepare carpools out to the fields to the south of the city. Smoke was turning the sun into a dull orange disk, and the students and other community volunteers had gathered at the offices of a local advocacy organization to collect protective particulate masks to distribute to farmworkers still laboring in the fields in south Oxnard and nearby Camarillo. 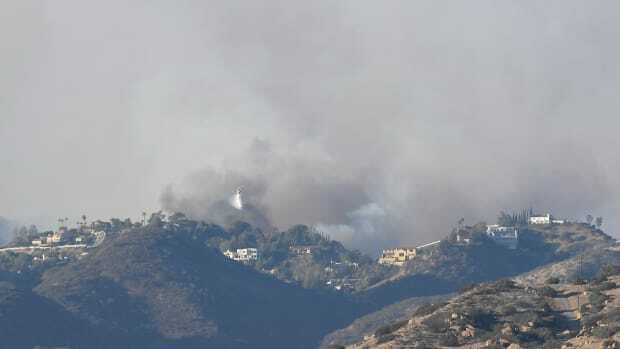 The students&apos; Friday classes had been canceled, and local officials all over Southern California had broadcast warnings advising residents to stay indoors and avoid all exercise. However, many members of the community, still recovering from the record-breaking Thomas Fire of 2017 (the largest in the state&apos;s history), knew that farmworkers would continue to be laboring in the fields, just as they had during the Thomas Fire. "We set a time to meet once we started seeing the sky. 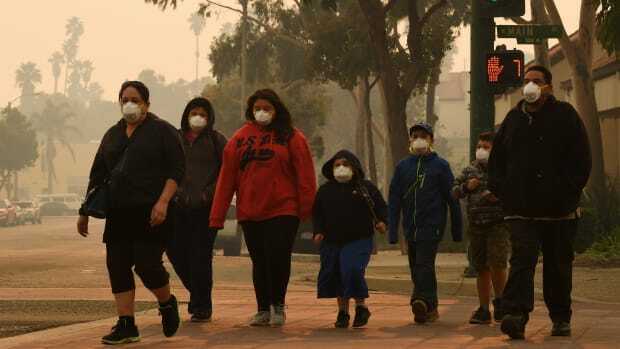 The air was getting worse and worse," says Aracely Preciado, a youth organizer in Oxnard. "We sent out a call on social media, and students and other community members began showing up." The organization Preciado works for, the Central Coast Alliance for a Sustainable Economy, or CAUSE, distributed over 15,000 masks to farmworkers during the Thomas Fire. Lucas Zucker, CAUSE&apos;s policy and communication director, says that, while the smoke from the current fires is not nearly as bad the smoke from last year&apos;s inferno, farmworkers are still laboring in smoky conditions. "It&apos;s a mixed bag. You have a lot of farms that actually speed up production instead of slow down, because they want to harvest before the crops are damaged by ash," Zucker says. "Other workers get the day off, but then they aren&apos;t paid." Zucker says that laborers often cannot afford to miss a day of work, especially because many of them are unable to claim any kind of disaster relief because of their immigration status. Even though California&apos;s labor laws call for employers to determine if conditions are too harmful for farmworkers to work, Zucker says that state officials rarely travel to rural areas to enforce these protections. "Even though they have that guidance, there&apos;s essentially no teeth behind it," he says. The law also calls for employers to offer workplace protections and distribute particulate masks to protect workers&apos; lungs in potentially harmful—but not yet hazardous—conditions, in which work can continue. Zucker says that, during the Thomas Fire, however, few farm employers distributed such masks. 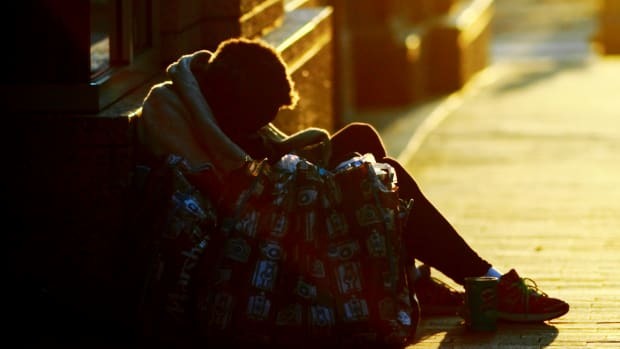 This year, he says, there has been some improvement, but CAUSE and other organizations still have had to fill in the gaps and get masks to unprotected workers. Preciado says that the workers she met with on Friday were grateful to receive the protective masks from the 20 to 30 volunteers who showed up. She credits much of the volunteer turnout to a November 9th photo that went viral online, particularly in Latinx activists circles (most of the farmworkers in the Oxnard area are Latinx). 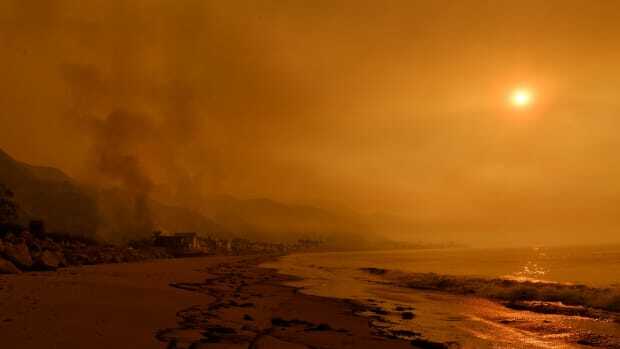 Shot by Andy Holzman of the Southern California News Group, the startling photo shows a black sky eerily lit by a weak orange sun. At the forefront, workers bend over rows of crops, laboring in the unusual dark of the midday. "It was a very dark gray sky. It covered even the sun, and everything looked very awful, and people were still out there working," Peciado says. She says many of the community members who came to distribute masks told her they&apos;d been shocked into action by the photo. In the past, according to Zucker, supervisors and other management staff on the farms have tried to prevent volunteers from entering to distribute masks. Zucker says that agricultural organizations will often cite food safety concerns as justification to block access to volunteers, but he also thinks that such action is typical of an industry wary of workers becoming organized. "It&apos;s an industry that has a pattern of exploitation. Workers and managers are used to tough labor conditions, down at the bottom rung of the labor market," Zucker says. 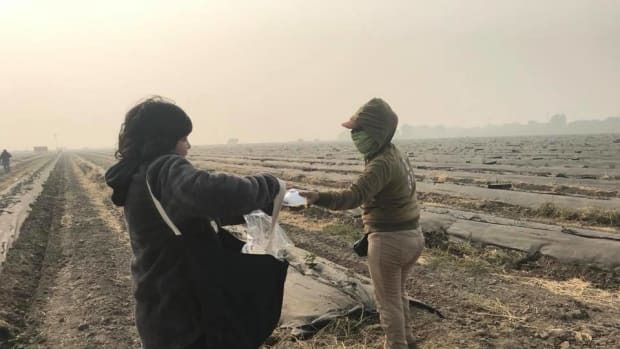 Even when employers or volunteers do manage to distribute lung protection to workers, Zucker notes that masks often interfere with work characterized by backbreaking labor and hazards from pesticides and other toxins sometimes already in the fields. "The reality is that farmworkers are out there, doing hard manual labor, and those masks are getting sweaty and uncomfortable," he says. "The smoke is one more thing on top of an already dangerous job." What Are the Santa Ana Winds, and Why Are They Such a Wildfire Hazard? 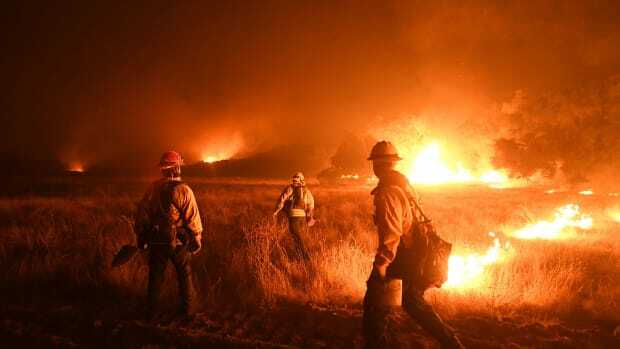 The hot, dry winds turn drought-ridden areas of Southern California into a tinderbox in the fall.